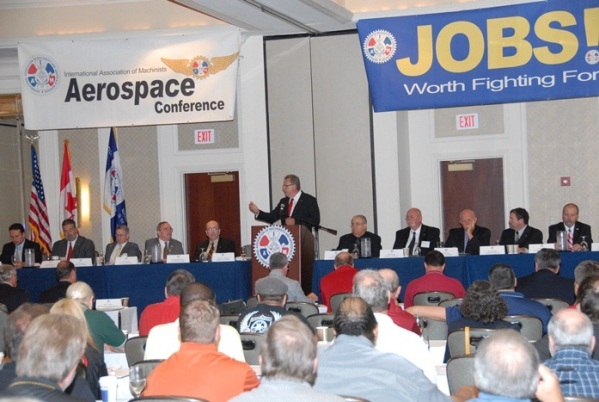 IAM Headquarters General Vice President Rich Michalski addresses the 2011 Aerospace Conference in Nashville, TN. IAM leaders and activists from the United States and Canada representing tens of thousands members from Boeing, Bombardier, Lockheed Martin, GKN, Spirit, Raytheon, Pratt & Whitney, Triumph, General Electric and others are meeting in Nashville, TN, this week for the 2011 IAM Aerospace Conference. International President Tom Buffenbarger delivered a wide-ranging keynote address but focused on the importance of the upcoming votes on the Colombia, Panama and South Korea Free Trade Agreements. Also addressing delegates on the first day of the conference was Southern Territory GVP Bob Martinez, District 711 DBR Ricky Wallace, Executive Director of the Canadian Council for Aviation and Aerospace Robert Donald, IAM National Pension Fund Director Steve Sleigh, IAM Organizing Director George Myers and The Street.com Reporter Ted Reed.